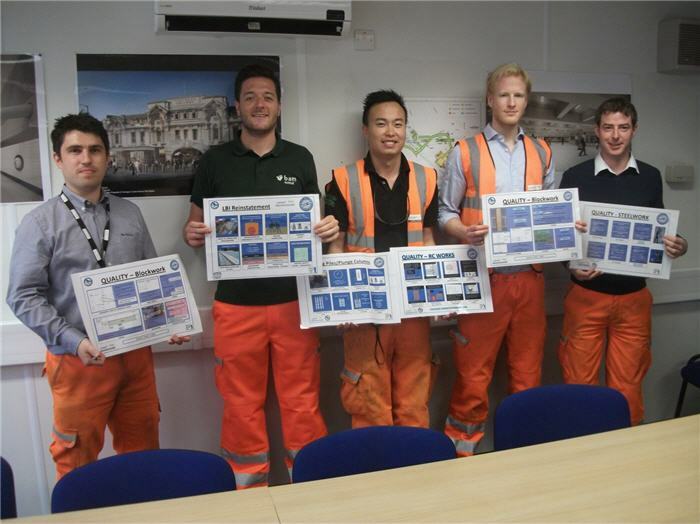 John Ryan, Dickson Pang, Chris Tye, Michael Bradley and Luke Tracey – engineers on Taylor Woodrow BAM Nuttall’s London project, were commended for developing posters to communicate key parts of the specification in a visual and simple manner. The posters support inspection and test plans, and are displayed on site notice boards to ensure quality standards are clearly communicated and available at all times. The Document Control team at Victoria Dock Portal – Karen, Xenia and Gemma – received a highly commended award for demonstrating a high level of attention to detail, thoroughly checking all documentation prior to submission to Crossrail, which has resulted in the team topping the Crossrail League Table for Documentation. In addition, the Nottingham Hub team have been recognised for their excellent work on the public right of way at Nottingham Station, which was completed to a tight programme and handed over Defect Free.